I was using an old flip phone until last month, when it broke for good. But as I am new to everything that is related to smartphone/apps/etc, I still have a few questions before making a pre-order for the fairphone 2. But I am very interested in buying Fair Trade, and this phone looks like a good option for the kind of consumer that I am. Does it work in Canada (Quebec) ? With every phone company (Bell, Koodo, etc) ? Will I be able to have some support here in Canada if anything breaks on the phone ? Are the Apple applications for Iphone available for the Fairphone (Google maps, etc.) or do you guys have your own apps ? Is there a place where I can see every apps available ? How does it works ? In Europe the electrical plugs are different than here in Canada… Will the charger be adapted to Canadian standard (110/240) ? While we love our fans in Australia and New Zealand (and Brazil and Canada and all of you outside Europe), there are no official plans yet to announce if we’re going to sell or service Fairphone 2 outside Europe at this time. We’re looking to move ‘outside Europe’ in 2016 but we don’t know yet where…it does depend a lot on the interest and our capacity. In this wiki @Stefan explains how to check whether the Fairphone works in a specific country. There is a link to a GSM coverage list in which you can also see which frequencies your phone providers use. As far as I can understand, most of the functionalities should work fine with Bell. I’m not sure but I can’t find the Fairphone’s LTE bands in the lists of providers other than Bell. So that might only work with that provider. Once they sell the phone in Canada, they’ll probably also offer support services. However, their office remains in Amsterdam and I doubt that there will be representatives inside Canadian borders. Yet I would not worry about that too much: We are a very helpful community in this forum, oftenly able to solve problems ourselves (there are some real techies in here). Always remember that the Fairphone company is a young social enterprise founded in 2013 (the Fairphone project started in 2010). If you want to see more facts on what Fairphone is, how they work and what their goals are, consider reading this fact sheet. The Fairphone 2 will probably run Android so you will be able to run any app from Google’s Play Store or a alternative App Store on the phone. Like most other smartphones on the market (primarily those without the fruit on it), the Fairphone is also charged via a standard micro-USB plug. So any standard USB smartphone charger should work. For ecological reasons there is no charger included when you buy a Fairphone so you will have to order one separately. Thank you very much huskers! 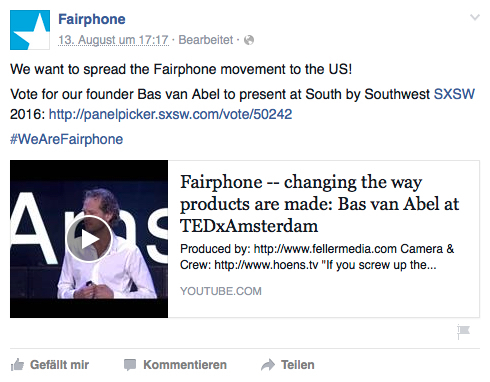 So even if the Fairphone works with Bell, I won’t be able to buy one since it is not distributed to Canada. Right ? I don’t know if you are working for FP or just a friendly user, but if anybody from FP read this, I would be interested in trying/buying the phone in Canada if you want a ‘‘tester’’ outside of Europe. In the meanwhile, I’m gonna just try to recycle another old flip from another friend, in waiting for the next FP which will be distributed in Canada. I won’t be able to buy one since it is not distributed to Canada. Right ? This forum is made for Fairphone owners, fans, critics and anyone who is interested in the project. It is not even moderated by Fairphone staff, so if you want to address the Fairphone team directly you should contact them by submitting a request. But the demand is high, and you should check out if the Fairphone will work for you (as discussed above). It will be safer to wait for an official release in Canada, but I wanted to show you that there are possibilities. But it seemed to be working (at least partially…?). Anyway, I bought a Fairphone 2, which I shipped to my home in France when I was in vacation. When I arrived in Montreal I turned on the phone and… Taaaadaaaam! Works perfeclty with my provider Fido at least in the Montreal area : 2G 3G 4G. I did not try somewhere else yet. I will update this post later ! PS : for french readers, I recommand this very nice blog post about the Fairphone 2 https://grisebouille.net/fairphone-un-telephone-pour-libriste/ This convinces me. My FP2 works also perfectly with the provider FIDO!! I’m currently in Newfoundland and can report that the FP2 works just fine with Rogers. Has anyone tried with another company than Fido/Rogers? Anyone interested in sharing with me their IMEI (in private) so I can check with a company if the FP2 is working on their network? I have a FP1 working with Fido, but now I moved to another area where there is no Fido coverage, booouh.